Two Closes and a Referendum is an engaging tale of ordinary people in an extraordinary time. This novel brilliantly captures the growing excitement and fervour of the 2014 Independence Referendum that changed Scotland for ever, as ordinary citizens explored their identity and wrestled with the hopes and fears that surrounded the choice they were asked to make. The novel has already earned serious praise from eminent Scots critics. “Mary McCabe’s previous work Stirring the Dust was a linguistic tour de force which celebrated the rich diversity of the Scots language from Banffshire to the Banks of Clyde. Here with Two Closes and a Referendum, once again she demonstrates an acute ear for dialogue, and a lug tuned perfectly to the speech of Glasgow in the 21st century wi gleg observations on a wheen Glesga fowk. This novel is a poignant recollection of a dramatic year in her city’s history – one which united and divided its people – the year of the Scottish Referendum of 2014. There are love affairs lost and found, tensions between people and dilemmas within people played out against the compelling narrative of a populace desperately wanting hope to triumph over fear. 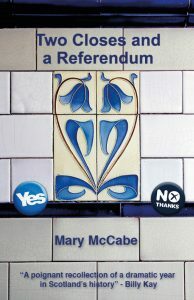 Mary McCabe is already the author of two published books. Everwinding Times, a novel about people, is still as relevant and insightful today as when it was first published. Stirring the Dust, a family biography, received much critical praise when first published in 2012, including from James Robertson, Janet Paisley and Margaret Elphinstone. It is no coincidence that both Billy Kay and Linda Fabiani (see above) both referred to their excitement that the author of Stirring the Dust has produced another book. Two Closes and a Referendum was published at the end of September 2017. It is now available for direct order with immediate dispatch.